The Ellen DeGeneres Show is genius. She is smart and funny, a tough combination to achieve. 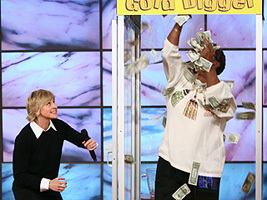 One of her segments is Gold Digger, in which a viewer gets a few moments in a box with flying money up for grabs. But a common theme I’ve noticed is the contestant usually freaks out and tries to grab the biggest clumps of cash. However, reflexes aren’t as fast as the fan blowing the money. So by the time their hand reaches the large wad, it’s gone. They try for the big bucks, yet end up with nothing. Having grown up on an Indian reservation (blocks from a casino), I’ve watched these cash boxes in action first hand. And I’ve always noticed the participant grabbing for the clumps while winding up with nothing. However, what rarely happens is the contestant thinking logically. We know the clumping strategy doesn’t work because we’re slower than the fan. But what does work is concentrating on one bill at a time. Humans have the ability to focus on one flying item and pluck it from the air. Maybe it’s an innate quality passed down from our hunter-gatherer ancestors. Whatever it is, we can focus and grab one item at a time. No matter how fast it’s flying. To reiterate, grabbing one bill at a time is the key to tons of cash. So what does this have to do with building your audience? In one word, everything. All to often, brands try to take a shortcut and grab for clumps of followers. They think it’s possible to bypass the need for individualized attention of their fan-base. This simply does not work. A friend of mine shared with me a Wall Street Journal article today about a company, Bill.com, complaining that their B2B business is not seeing any positives from social media. But as I explored deeper into their strategy they are failing to understand how to cultivate a following. The article states that they have over 10,000 customers. Yet hardly any followers. A quick glance at their Facebook page shows that they are all about themselves. Of the five or so status updates they’ve posted over the last couple months (pitiful I know), their wall is of their products, brand and pictures of a sponsored race car. Not too impressive. Where are they giving back to the customer? If I were to follow them, I’d want helpful articles, how-to’s and other posts of value. How easy would it be to create an alert in Hootsuite for Bill.com and respond to tweets like these? One focused response with a link to a testimonial or referral to another Bill.com user for third-party recommendation would almost guarantee they earned that customer’s business. And finally, I searched for their LinkedIn account… non-existent. Anyone complaining that their B2B social media strategy isn’t working, yet is not on LinkedIn, clearly hasn’t grasped the concept of finding a target platform. Because last time I checked, their are a lot of business people visiting LinkedIn on a daily basis. I don’t mean to pick on you Bill.com, I bet your service is great. But you’re complaining about social media not working, yet you’re failing to do it correctly. It’s not social media’s fault, it’s yours. You are grabbing at clumps when you should be seeking out bills. Pun intended. And who knows, I may follow or like you, Bill.com, before ever thinking of becoming a customer. Because if you added value to my life and business, I would see you as a source of knowledge and expertise. But until then, I’ll stick with your competitor, Freshbooks. They understand their customer. 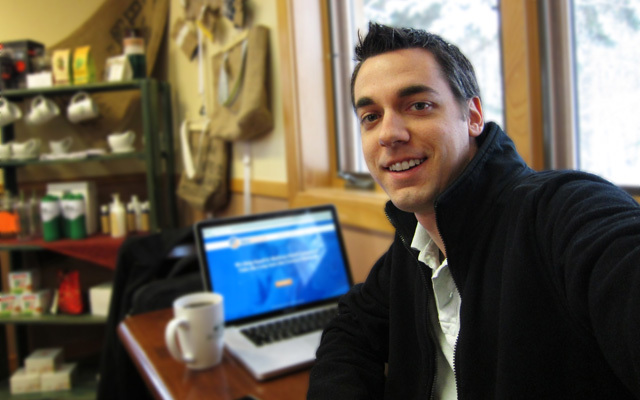 When building your audience, you must focus individualized attention on your followers. Grabbing for clumps of visitors by sending out self-centered posts, worthless tweets (no @replies) or not utilizing the best platforms, will not get you the pay-day you’re looking for. But rather, broke and alone.